This contribution focuses on the practice of intramural burial in Anatolia during the Roman Imperial period. The prominent tombs of this time may at first sight simply reﬂect a traditional habit of honouring benefactors, being in line with the retrospective cultural atmosphere that is often attributed to the Greek cities under Roman rule. However, a contextual analysis of the respective structures of the 1st and 2nd centuries AD, considering their design, inscriptions, and urban setting, reveals a new and significant pattern. This is the linking of the tomb with important public donations of the deceased. As a result, the monuments were turned into hybrid spaces that answered the specific demands of elite representation in their time. 1 Morris 1987, 62-71; Polignac 1996, 151-176. 2 Cp. 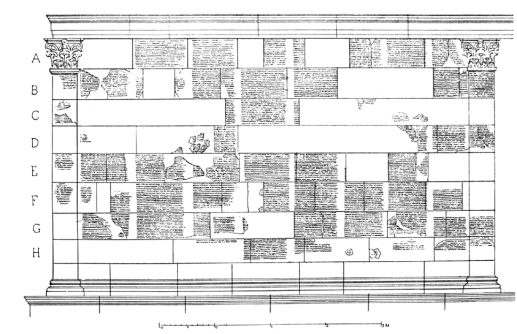 the catalogue of intra-urban tombs from the Greek world by Schörner 2007. 1In the ancient Greek city, a burial in the centre of a town was the customary way of singling out a person whose life and deeds were perceived as being especially important for the formation of local society. Its meaning was in fact intimately connected to the process of urbanization itself, when together with a spatial reorganization the average tombs were restricted to cemeteries outside the settlement areas1. Therefore, it comes as no surprise that together with the transformation of society, the circumstances of laying out intra-urban burials also changed over the course of time. This holds true for both the group of persons that would receive such a privilege and the exact location and design of the tomb. To get an idea of this development, we may think of the rather simple graves of the early oikistai, situated on the agora, the royal mausolea in the Greek periphery, or the lavishly decorated memorial buildings of the late Hellenistic euergetai, that were placed in various, but always especially visible positions2. 2In the following I would like to focus on tombs intra-muros of the Greek cities of Asia Minor during the middle imperial period, or roughly the time between the last quarter of the 1st and the end of the 2nd century AD. In this period, a number of hybrid constructions left their mark on the development of intra-urban burials, combining a variety of in part complementary, in part also contradictory features, of which the tomb proper was only one aspect. 3 Cormack 2004; Schörner 2007. 3Although most of the single monuments I shall deal with have long been known, and are also included in two recent publications on intra-urban tombs3, they have for diﬀerent reasons not been seen as a discrete group, sharing characteristics that defined their similar relation to the public. 4Thus, in the general survey of such burials in the Greek world by Hadwiga Schörner, findings from the geometric to the late imperial period are interpreted as a more or less coherent body of material. Thereby, the relation between the tombs’ remarkable design variations and their changing messages seems to be underestimated4. 5 Cormack 2004; Ewald 2008. 6 Foucault 2005. Cp. also Ewald 2008. 5In contrast to this, Sarah Cormack’s study on The Space of Death in Roman Asia Minor convincingly put to the foreground the particular cultural density of the respective monuments from the imperial period5. But her a priori idea of the tombs as spheres separated from the surrounding space as well as from the continuous ﬂow of time, adopted from Michel Foucault’s concept of hétérotopies6, partly obscured their rather open structure, which might have become even more obvious when chronologically structuring the still ample span of time covered in her work. Focussing on the examples from the middle imperial period, one could in fact stress their explicit blurring of traditional boundaries. These monuments often seem to merge diﬀerent modes of representation and thereby, rather than reﬂecting past lives and their values, appear active in a current debate; forming a kind of node in the network of overlapping means of public representation that seems typical for members of the local elites of that time. In the following, I shall try to demonstrate this with some examples. 7 Petersen/von Luschan 1889, 76-133; Kokkinia 2000; Cormack 2004, 36-40, 274-276. 8 Cp. Berns 2003, 144-145, 160-161. 10 Petersen/von Luschan 1889, 76-133, esp. 76-81 with fg. 54-63. 6At Rhodiapolis in Lycia, such an intra-urban tomb was commissioned around the middle of the 2nd century AD by a famous local benefactor named Opramoas, son of Apollonios7. The building was designed as a small temple in antis on a low podium. We do not know what the cella of this monument looked like, but it is probably safe to imagine it being equipped with a sarcophagus and maybe also statues of Opramoas and members of his family. Both the architecture and its dimensions (ca. 7 x 8 m) follow a standard pattern of imperial period tombs in Asia Minor8. As for the location, Gerhard Huber’s plan of Rhodiapolis shows the monument in the centre of the small town with a number of public buildings clustered in the form of a half-circle (fig. 1)9. According to his section of the terrain (fig. 2), it stood in the middle of a terrace in front of the theatre. In recent years, an anastilosis of the building has been made using the numerous stone blocks that were scattered over the place. A tentative reconstruction, however, had already been published by Eugen Petersen and Felix von Luschan in the late nineteenth century (fgs. 3-4)10. Although their drawings can of course not replace a thorough architectural study, they highlight a most striking feature; that is the long inscriptions that almost completely covered the walls of the building11. 7These texts were also referred to by Cormack12. Her statement that they “constituted an ambitious biographical programme” is however misleading, as none of these inscriptions gives any explicit and coherent biographical information, which can only be extracted from the texts by reading them against the grain. 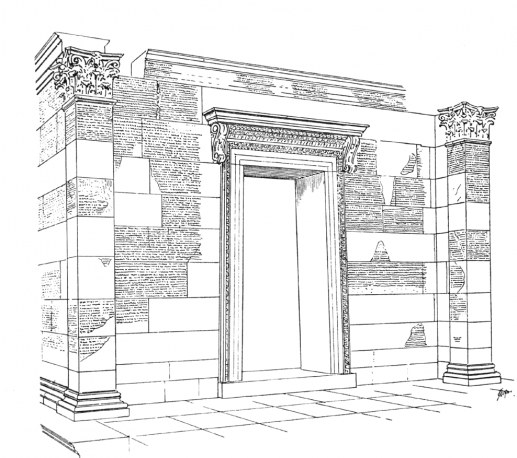 Moreover, they do not even allude to the fact that the building was the tomb of Opramoas. Although he is mentioned in every single one of the texts, he is never called hero, nor is there any other indication of his death, which in fact will have occurred some years after the tomb had been erected and the inscriptions engraved13. 14 Kokkinia 2000, no. 64 (XVIII F-XIX D). 8Instead, the message is mainly constricted to Opramoas’ benefactions and his good relations to Roman authorities. In part, we are dealing with copies of honorific decrees adopted by the Lycian Council and meticulously listing donations, before stipulating the honours the euergetes was granted. They refer, for example, to the enormous donation made by Opramoas to various Lycian cities after an earthquake that seems to have damaged many buildings, listing the amount of money, the receiving city, and the purpose it was meant for14. 15 Kokkinia 2000, no. 1-12 (I B-III D). 16 Kokkinia 2000, no. 39-52 (X H-XII G). 9Other documents are copies of letters addressed to various cities of Lycia or the Lycian Council in general, written by Roman officials, such as the provincial governor15, or the emperor Antoninus Pius himself16. These texts, being shorter and as a rule not mentioning single donations, represent letters of recommendation, recalling in a general way Opramoas’ offices and benefactions. 10Publishing these documents on the walls of the tomb was obviously aimed at showing Opramoas as an important member of the local society. However, this was not done through vague formulas of exuberant praise, but by precisely recalling all the places where he had acted as a benefactor. The collection of names produces an impressive list of cities, which more or less cover the whole of Lycia17. Such a list tells us that instead of focusing his eﬀorts on his hometown or a few important places, Opramoas spread his wealth all over the country with donations ranging from 5.000 to 100.000 denarii. Because all of these benefactions must have been publicly documented by inscriptions on the buildings he had sponsored, Opramoas created in fact a wide and visually conceivable network of public activities, that continued to exist beyond the actual event of spending money. The fact that he had inscribed the official documents related to his benefactions on the walls of his tomb turned this monument into part of this network and in fact into its central node. 18 Cp. Kalinka 1944 no. 907. 908; Huber 2006. 11This also becomes clear within the local context at Rhodiapolis. Here the tomb did not only occupy the midpoint of the town, but the centre of Opramoas’ local benefactions, a number of small structures that had been placed at the edges of the central square (fig. 1)18. For Cormack this was an indication that the same square had been transformed into a “cult temenos for Rhodiapolis’ most famous citizen and his family”19. While she is certainly right in underlining the perfect position of Opramoas’ tomb within the inclining terrain, where it dominates the city’s lower areas and at the same time had a close connection to the theatre (fig. 2), her interpretation seems to oversimplify the monument’s complex relationship with the square in question. This is situated on a lower level compared to the tomb and clearly separated from it by a substantial terrace wall. At the same time, the various buildings assembled here indicate that it maintained the character of an open plaza serving a variety of public functions, rather than having been transformed into an exclusive space for the veneration of a prominent citizen. The visual connection between the tomb and Opramoas’ donations would instead stress his important contributions to the embellishment of Rhodiapolis and indeed, if we take the documents published on the walls of the building itself into account, of the entire Lycia. This direct link between the intramural tomb and the benefactions its owner made is a new and, I believe, significant feature of the Roman imperial cities in the Greek east. 21 Waelkens et al. 2000. 12This impression may be further supported by a comparison with the situation during the 1st century BC, that is the late Hellenistic and the first years of the Early imperial period. Then, a famous pattern in designing intramural tombs was the hermetic monument combining diverse and often contradictory elements to create an image of sumptuousness20. An example from Sagalassos, the so-called North-west Heroon, comprises a stepped roof podium supporting a temple-like building, seated above a frieze with reliefs of dancers (fig. 5). Elevated high above the ground, the superstructure could not be accessed and it was therefore impossible to use this building as a space for rituals memorizing the deceased21. A similar phenomenon can be observed at the so-called Octagon in Ephesos, which Hilke Thür believes to be the tomb of the Ptolemaic princess Arsinoë IV, though the evidence for this assumption seems rather weak22. While the function of these monuments must have been purely symbolic, they do not refer to specific deeds of their owners that might have granted them the privilege of a burial within an urban centre. Neither at Sagalassos nor at Ephesos do we know of any inscription that might have informed us about the owner of the respective memorial structures or his benefactions. The message of these and similar monuments was obviously restricted to the spectacular architecture itself. 13This architecture was at the same time costly, because of the amount of material and working power that was needed to build it, and useless in the practical sense of the word, as one could only look at, but not enter it. Therefore these monuments appeared as a kind of conspicuous consumption, and thereby as evidence of the owner’s high social status23. 26 Naumann 1973/74; Cormack 2004, 35. 166-168; Schörner 2007, 256-257 cat. A 28. 14In contrast to this, the eﬀect of the intramural tombs of the Roman imperial period was rather indirectly mediated, as the architecture proper remained conventional. In many cases we are dealing with more or less standard temple-forms, such as examples from Miletos24, Knidos25, Aizanoi26, and perhaps also at Sidyma27 can prove. This basic pattern was probably intended to create a sacral overtone that was suited to the occasional perception of the benefactors as heroes or receiving timai isotheoi28. 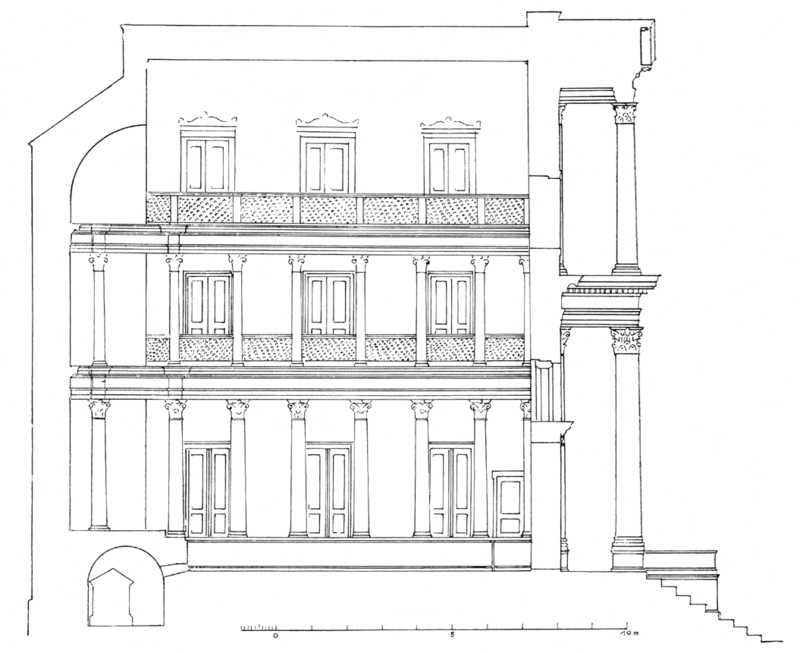 However, the architectural type was in no way exclusive for outstanding personalities, and was also widely used in Roman imperial Asia Minor for monumental tombs in the context of necropoleis29. 32 Müller Wiener 1985; Kader 1995, 209-211; Schörner 2007, 237-238. 35 ‘Heroon III’ at Miletus, see below. 15The sacral shape of the buildings must also not be misunderstood as indicating a primary connection with ritual. Significantly, the various monuments do not seem to have been complemented with an altar30. Moreover, they miss all elements of proper heroa, especially a number of diﬀerent rooms providing banqueting space for collective veneration. Such structures are known from the Hellenistic period, where they constituted a second pattern for sumptuous tombs, in addition to the hermetic monuments cited before31. An example is the so-called Heroon I at Miletus, where a kind of tumulus was placed in a courtyard limited on one or two sides by a stoa with a set of chambers32. In a somewhat simplified form this type of monument also appeared in the necropoleis of the Roman imperial period33. The typical intramural tomb of the middle imperial period would instead not even have a walled peribolos demarcating it as a sphere diﬀerent from the urban surroundings34. Only in the late imperial period, that is again after a significant shift in the structure of public space, does the first tomb with a peribolos appear within an urban centre after the Hellenistic predecessors35. 36 Cp. for example Oberleitner et al. 1978, 118-119 no. 172 fg. 1000; Hesberg 2009. 16The lack of any delimitation meant that the tombs became part of the continuous space of the urban landscape, which is further underlined by their design being derived from public architecture. Also the long inscriptions of official letters and other documents on walls as at the tomb of Opramoas at Rhodiapolis is a pattern an observer would be confronted with in many places of a town centre36. Therefore, the respective monuments appear not as separated, but as hybrid spaces integrating a number of otherwise diﬀerentiated functions with the aim of coherently representing their owner. 37 Hoepfner 2002, 73-78; Hiesel/Strocka 2006. 17This becomes especially obvious in a number of at first sight bizarre tombs that are immediately enclosed in public buildings. One such tomb has emerged during the excavations of the public library in the centre of Nysa, a structure that mainly consisted of a rectangular hall where the papyrus scrolls would have been kept in bookcases37. Under the ﬂoor of the colonnade that decorated the monument’s facade, Volker Michael Strocka found a marble sarcophagus with the skeletons of a middle aged woman and a young man. As Strocka has proven in his recent study of the sarcophagus, it had been worked in the same time as the building itself, that is in the Hadrianic period, and therefore will have been buried at this unusual place in connection with a donation, probably of the whole monument, even if no inscriptions survive to tell us anything about the identity of the corpses or the origin of the building38. 39 Plin. epist. 10, 81; cp. Sherwin-White 1966, 675-679. 18This is not the only example from Roman imperial Asia Minor combining a public library with a tomb. Apart from the famous bibliotheke of Celsus at Ephesos that will be studied below, a similar case is known from one of the letters that Pliny the younger wrote to emperor Trajan when he was governor of the Roman province of Pontus Bithynia probably around 110 AD. Here, in the city of Prusa ad Olympum, the writer Dio Chrysostom controlled and most probably also commissioned the building of a library, which at the same time seems to have served as a tomb monument for his wife and son, leading to criticism from his competitors in local politics39. 40 Neudecker 2004, 303-304. Cp. Delorme 1960, 337-361. 19The laying out of the graves in the library may well have referred to the traditional habit of burying great minds within the gymnasium, where they served as a constant example for the youth exercising their intellectual as well as their physical skills40. At the same time, however, the combination of a substantial donation to the public with a tomb will have guaranteed the perpetual eﬀect of the benefaction, because the building could not easily be knocked down without risking the sacrilege of destroying the graves. The lavish architecture in combination with the library it housed was thus a constant reminder of the reasons for the privilege that a public burial always meant. 20Consequently, there are also examples of tombs in other types of buildings, like a bath in the city of Argos in Greece, where three undecorated sarcophagi have been found in a subterranean chamber under the apse of a hall opposite the bathing wing. Again, we can only assume that the burial was allowed in connection with a donation, perhaps for the rebuilding of the complex41. At Aphrodisias a member of a prominent local family named Adrastus seems to have been buried in his ergasteria, probably a kind of stoa with workshops, in the third quarter of the 1st century AD42. The source for this event is a decree from Aphrodisias that is difficult to understand exactly due to its fragmentation. However, the public ergasteria, which according to the inscription were originally oﬀered for the burial, must be identical with the substantial stoa behind the bouleuterion in the centre of the town, where Peter Rockwell was able to identify a sculptor’s workshop43. Therefore the structure of Adrastus will probably have been a similar building, rather than the temporary stalls that Jocelyn Reynolds imagined to have been removed for the creation of a separate tomb monument44. The stone block on which the inscription was engraved may have easily belonged to such a stoa, where after his death the local benefactor would have been buried. 21The diversity of overlapping roles a prominent citizen might fulfill, as well as their integration in one central monument, is best demonstrated by the well-known library at Ephesus from around 115 AD, which I shall look at in some detail in the following (figs. 6-7). The library was founded by the former consul, Tib. Iulius Aquila Polemeanus, honouring his father, the proconsul Asiae, Tib. Iulius Celsus Polemeanus. The construction was completed by another citizen of Ephesus, Tib. Claudius Aristion. The whole monument is a good example of the self-representation of a member of the provincial elite during the late 1st to 2nd century AD, as Volker Michael Strocka and Bert Smith have demonstrated, on whose observations most of the following remarks are based45. 46 Wilberg et al. 1953, 40-41. 43-46; Strocka 2009, 247-249. 47 Wilberg et al. 1953, 61-80; Meriç et al. 1981, no. 5101-5115. 48 Strocka 2009, 249-250 fg. 2. 22Again the honoured person, Celsus Polemeanus, was buried inside the building his son had so generously donated to the public. However, this fact inﬂuenced the layout and decoration of the monument to only a very limited extent. For instance, Celsus’ sarcophagus is hidden in a subterranean chamber and was not immediately visible from the outside (fig. 7)46. Also, among the many inscriptions engraved on diﬀerent parts of the building, none refers to Celsus’ death47. At the most, one may point to certain sepulchral symbols almost hidden within the rich architectural decoration, like the eagle depicted on the scrolled frieze of the upper storey. The animal may have been perceived as a symbol of apotheosis, but also as a hint to the name of the library’s founder, Aquila48. 50 Wilberg et al. 1953, 4-35. 51 Berns 2002, 159 fg. 2. 23The building had been erected in a most prominent position, bordering the long side of a small square in front of the southern entrance of the lower agora. At this place, an observer could compare it to a number of nearby memorial structures from the late Hellenistic period, lining the lower section of the Embolos, or main street, of Ephesos49. As this street makes a sharp turn in front of the square, the library was (and after its modern anastylosis is again) the focal point of the road between the upper and the lower part of the city. The building’s outer appearance was striking by its lavish facade, a two storied composition of richly ornamented aediculae made from white marble that framed a number of marble statues (fig. 6)50. This facade with its ample display of costly material was a perfect image of Aquila’s generosity and corresponded well to the standard of luxurious public architecture adorning the civic centre of Ephesus during the middle imperial period, when a number of similar facades were built along the principle axis in combination with buildings of very diﬀerent functions51. 53 Wilberg et al. 1953, 35-41; Neudecker 2004, 302-304. 24Only when approaching the building and studying it in detail would the observer have realized a third subject of the monument’s complex message, that is the image of Celsus as an educated man. This was expressed by four female statues on display in niches on the facade’s ground ﬂoor, portraying personifications of Hellenic cultural virtues including knowledge or wisdom (episteme and sophia), which are identified and attributed to Celsus by their inscriptions52. At the same time, the statues’ subject may be seen as a prelude for the theme of the inner hall that was accessible through three wide doors framed by the same niches. Here, papyrus scrolls must have been kept in bookcases that were integrated into the niches of the ground ﬂoor, while on the upper ﬂoor further statues and perhaps also paintings may have been on display, as Richard Neudecker has suggested contra the reconstruction of this room by its excavators53. However, the possession of knowledge demonstrated by the library itself and its iconographic programme did not describe some specific personal preferences of Celsus, nor were they simply a reﬂection of the current intellectual fashion. As Thomas Schmitz has proved in his detailed study on “Bildung und Macht”, education was one of the means of distinction by which members of the local elites, especially during the 2nd century AD, justified their oligarchic position to the extent that obtaining paideia and belonging to the political elite appeared as congruent54. 56 Wilberg et al. 1953, 62-66; Meriç et al. 1981, no. 5102-5103. 25Finally, a fourth aspect of the library’s decoration was connected to a genuine Roman pattern of personal representation. These are the twelve fasces that were integrated into the scrolled pilasters of the façade’s ground ﬂoor. Symbolizing the administrative and military power of Celsus during his consulship at Rome and later as a proconsul of the province of Asia, they referred to his brilliant career as a Roman official55. Celsus’ cursus honorum is further documented in detail on the sides of two bases for equestrian statues that framed the stairs in front of the library56. This part of Celsus’ public life was completed by a statue of him wearing a Roman cuirass. It was originally on display in the façade’s upper storey, where further statues, attested by their inscribed pedestals, would have shown him most probably wearing the Greek himation and the Roman toga, while the two equestrian statues must have been similar counterparts57. 58 Cp. catalogue and appendices in Schäfer 1989. 26Taken as a whole, the library of Celsus was a highly diﬀerentiated monument, showing the prominent man in a variety of roles each of which referred to a specific field of public representation. 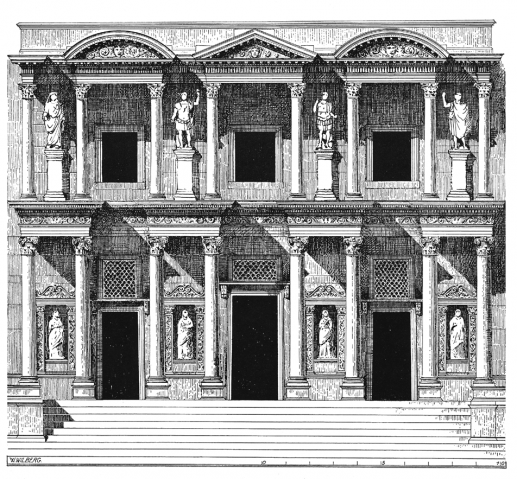 While the lavishness of the building proper was a rather unspecific way of demonstrating one’s power by financial generosity, the allusions to Celsus’ Greek education represented the values of a small group of elite citizens. The burial of a prominent benefactor in the urban centre had a long tradition in the Greek East and was well conceivable by local people as evidence of his (or her) special prestige, whereas images of the specifc symbols of Roman power are extremely rare in the same realm and might not even have been understood by every observer58. On the other hand, the wide range of topics addressed by the library’s decoration illustrates well the diverse expectations a member of the political elite in a Greek city of the Roman imperial period had to meet in conceiving his public image. In this respect the person of Celsus, with his imperial career, certainly counts as an extreme example. However, judging from the other intra-urban tombs discussed here, similar attempts to balance the various roles, and to call the personal contribution of the owner to public life to mind with a central monument, are also attested among primarily local political elites. 27It is probably no coincidence that this specific kind of monumental tomb in an urban context is so far known only from the first two centuries AD. 28During this period, innumerable inscriptions on pedestals of honorific statues, public documents written on stone or dedications of buildings donated by members of the local elites, illustrate well the prevailing paradigm of representation transgressing the temporal limits of the single act of donating for a public project. Only during the 3rd century can we observe a decline of this pattern, when performative ways of public self-display have gained more importance59. 60 Weber 2004, 101-150. Cp. also Cormack 2004, 30, 244-245, and Schörner 2007, 258-259 cat. A 29. 29This general impression is confirmed by the significant architectural structure of an intraurban tomb from Miletus that, according to the comprehensive study by Berthold Weber, was built in the beginning of the 3rd century AD60. Like its predecessors, this so-called Heroon III was placed near the political centre of the city, just three insulae southwest of the bouleuterion and the presumed agora, and almost next to the ‘baths of Faustina’. Most probably, we are dealing with the tomb of an important local family61. However, its design followed a pattern completely diﬀerent from the monuments presented so far (fig. 8). In spite of its prominent location, the tomb itself was hidden behind the wall of the peristyle enclosing it. This wall is partly preserved and does not show any kind of architectural decoration62. The whole structure’s outer appearance was therefore rather frugal and could in no way compete with the lavish architecture of the earlier examples, as neither would do the simple chapel within the complex. 30On the other hand, the layout provided ample space for performances memorializing the dead, as it covered a complete insula within Miletos’ regular grid of streets. Gatherings of a greater number of people might have taken place in the halls of the peristyle, where there was also a special exedra in the middle axis. The dead bodies had eﬀectively been set on stage as the midpoint of a three level structure. First, the whole complex would have been entered through a door in the south wall that allowed control of access. From there, the visitor would have proceeded and crossed the peristyle to enter the chapel at its centre, whose door opened to the north. Finally, inside the chapel, a substantial podium is preserved, obviously meant to elevate the main sarcophagus, while additional sarcophagi might have stood in a number of wall niches63. 31The spatial structure of ‘Heroon III’ produced a characteristic ambiguity between attraction and withdrawal that made the dead appear as totally diﬀerent from the visitors of their tomb. This habitus is further underlined by the absence of any testimony of the venerated persons’ achievements that would have granted them the privilege of an intra-urban burial. Despite the monument’s relatively good preservation, we have no indications that any inscriptions listing specific benefactions or symbols of offices held or honours obtained had once decorated the walls of the tomb. All this will have contributed to making the heroon a sphere separated from the urban space, where the dead were perceived through categories diﬀerent from the ones applied during their lifetime. 32This approach was obviously specific to the developments in the late imperial period, as it had in a certain way already been applied during the late Hellenistic period. During the first two centuries AD, intra-urban tombs expressed a diﬀerent paradigm for singling out extremely prominent people by generating hybrid spaces that permanently represented the variety of roles an euergetes of that time had to play when he wanted to distinguish himself from his fellow citizens. Aupert, P. 1986, “Thermes A et rue du Théâtre”, BCH 110, 1986, 767-771. Balland, A. 1981, Inscriptions d’époque impériale du Létôon, Paris, 1981. Benndorf, O. / Niemann, G. 1884, Reisen in Lykien und Karien, Vienne, 1884. Berns, Ch. 2002, “Frühkaiserzeitliche Tabernakelfassaden. Zum Beginn eines Leitmotivs urbaner Architektur in Kleinasien”, in Ch. Berns / H. von Hesberg / M. Waelkens / L. Vandeput, Patris und Imperium, Kulturelle und politische Identität in den Städten der römischen Provinzen Kleinasiens in der frühen Kaiserzeit, Louvain, 2002, 159-174. Berns, Ch. 2003, Untersuchungen zu den Grabbauten der frühen Kaiserzeit in Kleinasien, Bonn, 2003. Borg, B. / Witschel, Ch. 2001, “Veränderungen im Repräsentationsverhalten der römischer Eliten während des 3. Jhs. n. Chr.”, in G. Alföldy / S. Panciera (éds. ), Inschriftliche Denkmäler als Medien der Selbstdarstellung in der römischen Welt, Stuttgart, 2001, 47-120. Bruns-Özgan, Chr. 2009, “Eine feine Familie: Theopompos von Knidos und seine Nachkommen”, EA 42, 2009, 103-134. Cormack, S. 2004, The Space of Death in Roman Asia Minor, Vienne, 2004. Delorme, J. 1960, Gymnasion. Étude sur les monuments consacrés à l’éducation en Grèce, Paris, 1960. Ewald, B.Ch. 2008, “The tomb as heterotopia (Foucault’s ‘hétérotopies’): heroization, ritual and funerary art in Roman Asia Minor”, JRA 21, 2008, 624-634. Foucault, M. 2005, Die Heterotopien / Les hétérotopies, Der utopische Körper / Le corps utopique, Francfort, 2005. Oberleitner, W. / Gschwantler, K. / Bernhard-Walcher, A. / Bammer, A. 1978, Funde aus Ephesos und Samothrake, Vienne, 1978. Petersen, E. / von Luschan, F. 1889, Reisen in Lykien, Milyas und Kibyratis, Vienne, 1889. Polignac, F. de 1996, La naissance de la cité grecque, Paris, 1996. Ratté, Ch. 2008, “The founding of Aphrodisias”, in Ch. Ratté / R.R.R. Smith (éds. ), Aphrodisias Papers 4, Ann Arbor, 2008, 7-36. Reynolds, R.M. 1996, “Honouring benefactors at Aphrodisias: a new inscription”, in Ch. Roueché / R. Smith (éds. ), Aphrodisias Papers 3, Ann Arbor, 1996, 121-126. Rockwell, P. 1991, “Unfnished statuary associated with a sculptor’s studio”, in R.R.R. Smith / K.T. Erim (éds. ), Aphrodisias Papers 4, Ann Arbor, 1991, 127-143. Romeo, I. 2011, “The ‘Beautiful Tomb’ and civic identity in Julio-Claudian Hierapolis”, in F. d’Andria / I. Romeo (éds. 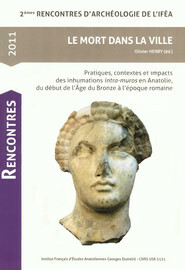 ), Roman Sculpture in Asia Minor, Proceedings of the International Conference to celebrate the 50th anniversary of the Italian excavations at Hierapolis in Phrygia, held on May 24-26, 2007, in Cavallino (Lecce), Portsmouth, 2011, 193-210. Rumscheid, F. 1998, Priene. Führer durch das ‘Pompeji Kleinasiens’, Istanbul, 1998. Schäfer, Th. 1989, Imperii Insignia. Sella curulis und fasces, Mayence, 1989. Schmitz, Th. 1997, Bildung und Macht. Zur sozialen und politischen Funktion der zweiten Sophistik in der griechischen Welt der Kaiserzeit, Munich, 1997. Schörner, H. 2005, “Grabarchitektur. Ausstattung und Beigaben als Indikatoren der Romanisierung/Romanisation in Asia am Beispiel des Grabbaus am Theater in Priene”, in G. Schörner (éd. ), Romanisierung – Romanisation. Theoretische Modelle und praktische Fallbeispiele, Oxford, 2005, 219-234. Heberdey, R. 1897, Opramoas: Inschriften vom Heroon zu Rhodiapolis, Vienne, 1897. Hesberg, H. v. 2009, “Archäologische Charakteristika der Inschriftenträger staatlicher Urkunden – Einige Beispiele”, in R. Haensch (éd. ), Selbstdarstellung und Kommunikation: Die Veröﬀentlichung staatlicher Urkunden auf Stein und Bronze in der römischen Welt, Munich, 2009, 19-56. Hiesel, G. / Strocka, V.M. 2006, “Die Bibliothek von Nysa am Mäander. Vorläufger Bericht über die Kampagnen 2002- 2006”, AA 2006/1, 81-97. Hoepfner, W. 2002, “Pergamon-Rhodos-Nysa-Athen. Bibliotheken in Gymnasien und anderen Lehr- und Forschungsstätten”, in W. Hoepfner (éd. ), Antike Bibliotheken, Mayence, 2002, 67-80. Huber 2006 Huber, G., “Rhodiapolis. Beziehungen zwischen Bauforschung und Epigraphik”, AAWW 141, 2006, 5-24. Kader, I. 1995, “Heroa und Memorialbauten”, in M. Wörrle / P. Zanker (éds. ), Stadtbild und Bürgerbild im Hellenismus, Munich, 1995, 199-229. Kalinka, E. 1944, Tituli Asiae Minoris II 3, Vienne, 1944. Kokkinia, Ch. 2000, Die Opramoas-Inschrift von Rhodiapolis. Euergetismus und Soziale Elite in Lykien, Bonn, 2000. Meriç, R. / Merkelbach, R. / Nollé, J. / Şahin, S. 1981, Die Inschriften von Ephesos VII 2, Bonn, 1981. Mert, I.H. 2002, “Der korinthische Tempel in Knidos. Vorbericht”, AA 2002/2, 9-22. Morris 1987 Morris, I., Burial and ancient society. The rise of the Greek citiy-state, Cambridge, 1987. Müller Wiener, W. 1985, “Arbeiten im Gebiet des Heroon am Theaterabhang (H 1)”, MDAI(I) 25, 1985, 16-22. Naumann, R. 1973/74, “Das Heroon auf der Agora in Aezani”, MDAI(I) 23/24, 1973/74, 183-195. Neudecker, R. 2004, “Aspekte öﬀentlicher Bibliotheken in der Kaiserzeit”, in B. Borg (éd. ), Paideia. The world of the Second Sophistic, Berlin, 2004, 293-314. Thür 1990 Thür, H., “Arsinoe IV, eine Schwester Kleopatras VII, Grabinhaberin des Oktogons von Ephesos? Ein Vorschlag”, JÖAI 60, 1990, 43-56. Waelkens, M. / Vandeput, L. / Berns, Ch. / Arıkan, B. / Poblome, J. / Torun, J. 2000, “The Northwest Heroon at Sagalassos”, in M. Waelkens / L. Loots (éds. ), Sagalassos V, Louvain, 2000, 553-593. Weber, B. 2004, Die römischen Heroa von Milet, Berlin, 2004. Wilberg, W. / Theuer, M. / Eichler, F. / Keil, J. 1953, Die Bibliothek (Forschungen in Ephesos V 1), Vienne, 1953. Schörner, H. 2007, Sepulturae graecae intra urbem. Untersuchungen zum Phänomen der intraurbanen Bestattungen bei den Griechen, Möhnesee, 2007. Sherwin-White, A.N. 1966, The letters of Pliny. A historical and social commentary, Oxford 1966. Smith, R.R.R. 1998, “Cultural Choice and Political Identity in Honorifc Portrait Statues in the Greek East in the Second Century A.D.”, JRS 88, 1998, 56-93. Strocka, V. M. 2009, “Die Celsusbibliothek als Ehrengrab am Embolos”, in S. Ladstätter (éd. ), Neue Forschungen zur Kuretenstraße von Ephesos, Akten des Symposions für Hilke Thür vom 13. Dezember 2006 an der Österreichischen Akademie der Wissenschaften, Vienne, 2009, 247-259. Strocka, V.M. 2011, “Der Stifter-Sarkophag der Bibliothek von Nysa am Mäander”, in F. d’Andria / I. Romeo (éds. ), Roman Sculpture in Asia Minor [Proceedings of the International Conference to celebrate the 50th anniversary of the Italian excavations at Hierapolis in Phrygia, held on May 24-26, 2007, in Cavallino (Lecce)], Portsmouth, 2011, 193. 11 Petersen/von Luschan 1889, 76-133; Heberdey 1897; Kalinka 1944, 327-350 no. 905. The inscriptions were republished together with additions, a German translation and an extensive commentary by Kokkinia 2000. 13 Cormack 2004, 276 is certainly wrong in assuming that the date of the last inscription (152 AD) marks the dead of Opramoas and the building of his tomb, as some of his later donations are attested in two inscriptions from the Letoon of Xanthos: Balland 1981, 173-224; Kokkinia 2000, 233-235. 17 Akalissos, Antiphellos, Aperlai, Arneai, Arykanda, Balbura, Bubon, Choma, Gagai, Kadyanda, Kalynda, Korydalla, Krya, Kyaneai, Limyra, Myra, Nisa, Oinoanda, Olympos, Patara, Phaselis, Phellos, Pinara, Podalia, Rhodiapolis, Sidyma, Symbra, Telmessos, Tlos, and Xanthos. 19 Cormack 2004, 36-37. Cormack’s assumption that the tombs of Opramoas’ father and mother are located in one of the porticoes remains speculative judging from the honorific inscriptions referred to as well as from the architectural evidence: Kalinka 1944, no. 915 and 916; Huber 2006, 12-14. 22 Thür 1990; Berns 2003, 45-46 with n. 247. 197 cat. 11A5; Cormack 2004, 41-42. 222; Schörner 2007, 240-242 cat. A 18. 24 ‘Heroon II’: Weber 2004, 3-100. Further: Cormack 2004, 39. 243- 245; Schörner 2007, 253-254 cat. A 26. – Cormack’s assumption that the tomb was transformed into a temple during the later imperial period contradicts the evidence, meticulously documented by Weber loc. cit. 25 Mert 2002. The conventional designation of this monument as a ‘Corinthian temple’, applied also by Mert, is misleading. The relief depicting four honorific wreaths, prominently placed over the entrance, as well as the shield in the tympanon, clearly speak for the connection with a benefactor whose tomb the monument must have been. 27 Berns 2003, 254-255 cat. 37A1; Cormack 2004, 39-40. 302-303 The position of the tomb may have been intra-urban, but evidence is difficult as structure and extension of the urban nucleus are unclear: Benndorf/Niemann 1884, 78 fig. 40 (III) pl. 22. 29 Berns 2003, 144-145, 160-161. A prominent example at Hierapolis, the so-called tomba bella, had in fact been built extra muros, before it happened to become intra-urban in the course of an extension of the urban perimeter: Romeo 2011. 30 The altar conventionally attributed to the Agora tomb at Aizanoi (Naumann 1973/74; Cormack 2004, 35, 166-168) cannot have belonged to the building, as Schörner 2007, 257 has proven. 34 The opposite impression in Cormack 2004, 29-49 and, following her, Ewald 2008, 625-626, is based on an intermingling of examples from diﬀerent periods as well as extra- and intra-urban tombs. In some cases also the relevant features are misinterpreted. The “peribolos wall” of ‘Heroon II’ at Miletus (Cormack 2004, 243) belongs to a Turkish cemetery (Weber 2004, 2, 4). A tomb at Priene, cited by Cormack 2004, 43, was not “built into the upper gymnasium”, but directly situated on one of the main streets: Rumscheid 1998, 177-180; Schörner 2005. 41 The situation is roughly described in Aupert 1986, where the sarcophagi are thought to be an addition made in late antiquity. In contrast, the assumption by Strocka 2009, 254-255 with n. 66, that they are contemporary with the rebuilding of the complex, seems more plausible. Strocka loc. cit. gives also a comprehensive bibliography of the numerous reports that up to now are the only documentation of the respective excavations. 43 Rockwell 1991, fg. 1. 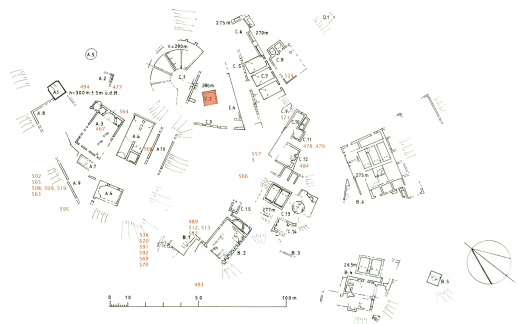 Comparison with the actual state of the excavation shows that the row of simple shops Rockwell published belonged to a more complex structure which is convincingly reconstructed as a π-shaped stoa on the recent plan of Aphrodisias’ city centre: Ratté 2008, fg. 8-9 no. 3. 44 Reynolds 1996, 125. At Knidos, a monument honouring members of a family of benefactors was set up in one of the shops of the stoa they had restored during the Hadrianic period, on what seems at that time to have served as a market place near the harbour: Bruns- Özgan 2009, 121-126 fig. 4. 45 Wilberg et al. 1953; Meriç et al. 1981, no. 5101-5115; Smith 1998, 73-75; Strocka 2009 (with references to his earlier articles on the subject). –The monument was also referred to in Cormack 2004, 40- 49, 222-223, and Schörner 2007, 250-252 cat. A 24. 52 Wilberg et al. 1953, 47-57. 71-72; Meriç et al. 1981, no. 5108-5111; Smith 1998, 74; Strocka 2009, 247-248. 55 Wilberg et al. 1953, 17 fg. 18, 29, 32; Schäfer 1989, 209-215, 374 B 2 pl. 84,7; Smith 1998, 75 pl. 8,2; Strocka 2009, 248. 57 Wilberg et al. 1953, 57-59, 66-71 fg. 101; Meriç et al. 1981, no. 5104- 5107; Smith 1998, 73-74 pl. 5,2; Strocka 2009, 248. 61 According to Weber 2004, 131, fragments of at least two sarcophagi had been found during the excavation of the complex. BERNS, Christof. The Tomb as a Node of public Representation : Intramural burials in Roman imperial Asia Minor In : Le Mort dans la ville : Pratiques, contextes et impacts des inhumations intra-muros en Anatolie, du début de l'Age du Bronze à l'époque romaine [en ligne]. Istanbul : Institut français d’études anatoliennes, 2013 (généré le 19 avril 2019). Disponible sur Internet : <http://books.openedition.org/ifeagd/2447>. ISBN : 9782362450556. DOI : 10.4000/books.ifeagd.2447. Berns, Christof. “The Tomb as a Node of public Representation : Intramural burials in Roman imperial Asia Minor ”. Henry, Olivier. Le Mort dans la ville : Pratiques, contextes et impacts des inhumations intra-muros en Anatolie, du début de l'Age du Bronze à l'époque romaine. Istanbul : Institut français d’études anatoliennes, 2013. (pp. 231-242) Web. <http://books.openedition.org/ifeagd/2447>. HENRY, Olivier (dir.). Le Mort dans la ville : Pratiques, contextes et impacts des inhumations intra-muros en Anatolie, du début de l'Age du Bronze à l'époque romaine. Nouvelle édition [en ligne]. Istanbul : Institut français d’études anatoliennes, 2013 (généré le 19 avril 2019). Disponible sur Internet : <http://books.openedition.org/ifeagd/2057>. ISBN : 9782362450556. DOI : 10.4000/books.ifeagd.2057.